National Novel Writing Month challenges writers from all over the world to complete a 50,000-word novel within the month of November. To help guide our readers who have taken on the challenge, we reached out to three-time National Jewish Book Award winner Howard Schwartz. 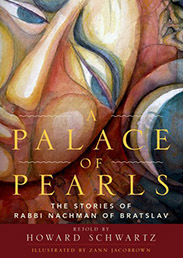 The podcast below recounts the story of “The Lost Princess,” a fairytale by Rabbi Nachman of Bratslav that has all the expected elements: a king, a lost princess, a quest, three giants, and an enchanted palace. Howard offers a deeper reading of the story, and his analysis demonstrates the power of allegories as literary devices. We usually assume that the folktales and fairy tales we encounter have come down to us anonymously. Sometimes we can’t even trace them to a specific country or time period. Of course, there are exceptions, such as the tales of Hans Christian Andersen. While his stories read as traditional folk and fairy tales, they are original, not retellings of stories he had heard in his youth. The Jewish storyteller Rabbi Nachman of Bratslav (1772-1810), perhaps the greatest of them all, told stories that he himself made up. Rabbi Nachman came from an exceptionally distinguished family. He was the great-grandson of Israel ben Eliezer, a Ukrainian peasant who came to be known as the Baal Shem Tov (Master of God’s Name). The Baal Shem Tov sometimes told stories, especially parables, but not folk or fairy tales like his great-grandson. In 1806, he told his first tale, “The Lost Princess.” This story certainly has all the earmarks of a traditional fairy tales: there is a king, a lost princess, a quest, three giants, and an enchanted palace. One day the king, whose daughter is his favorite, becomes angry with her and says, “Go the Devil,” and the next day she is gone. The distraught king sends his trusted minister to search for her, and the quest lasts several generations. Finally the minister learns that she is living in a palace of pearls on a golden mountain, and he undertakes a quest to find her there. For those unfamiliar with the role of allegory in Jewish stories, this story reads like a conventional fairy tale. First of all, every Hasid knew that in any tale about a king, that king surely refers to God. Then there are the six sons and one daughter. In Judaism there are six days of the week and the seventh day is the Sabbath. The Sabbath is identified with the Sabbath Queen. So, by implication, this story about the lost princess may also be about the Sabbath Queen, who is said to be present during the Sabbath. This mysterious being is also linked with a kabbalistic figure known as the Shekhinah, who is understood to be the feminine aspect of God in some mystical texts, and in others as the Bride of God. In the Zohar, the primary text of Jewish mysticism, there is a key myth that portrays the anger of God’s Bride because God failed to prevent the destruction of the Temple in Jerusalem. As a result, she separates herself from God, going into exile with her children, the Children of Israel, and makes it clear that she won’t return to God until the Temple, her home in this world, is restored. This story is about every man in every time, for the entire story occurs to every man individually, for everyone of Israel must occupy himself with this tikkun, namely to raise up the Shekhinah from her exile, to raise her up from the dust, and to liberate the Holy Kingdom from among the idolaters, and the Other Side (Sitre Achra) among whom she has been caught. Thus one finds that everyone in Israel is occupied with the search for the king’s daughter, to take her back to her father, for Israel as a whole has the character of the minister who searches for her. If “The Lost Princess” is read this way, it can be understood as a fairy tale retelling of this kabbalistic myth, where the king represents God and the lost princess is God’s Bride, who has been lost to Him. Thus Rabbi Nachman’s mysterious stories were a secret template for his followers to draw on in order to repair the rent in heaven and on earth. They were inspired by the teachings of a 16th century Rabbi, Isaac Luria, who proposed such a method of tikkun (repairing the world). Thus Rabbi Nachman’s stories, unique as they are, are in a direct line with the kabbalistic explanation for the fallen state of the world. And they also postulate an optimistic statement of hope that heaven and earth eventually can be repaired by the efforts of pious men. Featured image credit: Castle Fairy Tales Nature by _Jasmin_. CC0 via Pixabay. Howard Schwartz is a prolific author of fiction, poetry and children's literature, as well as an editor of fourteen volumes of Jewish parables and tales. He is a three-time National Jewish Book Award winner for Next Year in Jerusalem, The Day the Rabbi Disappeared, and Tree of Souls.